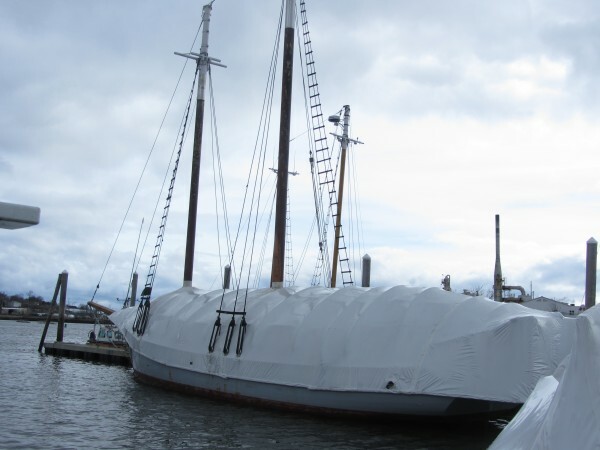 The schooner Timberwind is wrapped in plastic on Monday at Lermond's Cove in Rockland. ROCKLAND, Maine — A 96-foot schooner that operated out of Rockport Harbor for decades has been seized by federal authorities after a bank claimed its owners failed to make payments on a loan. On May 1, Magistrate Judge John Rich III ordered that the Timberwind be seized through what is known as a warrant of maritime arrest. He also appointed a company called Equinox to serve as custodian of the schooner until a decision is made on what to do with it. The vessel is wrapped in plastic and moored at Lermond’s Cove in Rockland. The federal court action was taken after Bar Harbor Bank & Trust filed a foreclosure complaint on May 1 in U.S. District Court in Portland. The Timberwind is owned by Robert Tassi and Dawn Tassi of Rockport. The couple had borrowed $325,000 from the bank in April 2009, failed to make payments and fell into default, according to the court complaint filed by the bank. As of April 23, the owners owed the bank $329,054 in principal, interest and late fees. The vessel has been offered for sale by the Tassi couple for $421,000. The Timberwind was built in 1931 by Victor Cole at the Union Wharf in Portland. The vessel served as a pilot boat, based out of Portland, until 1969. A new owner then retrofitted it and moved it to Rockport in 1970, when it began operating as a passenger vessel. The Timberwind has since offered tours of Marine Park in Rockport. When contacted Monday, Robert Tassi referred questions to his attorney, who could not immediately be reached for comment. The seizure of the Timberwind is the second midcoast schooner this year to meet that fate. The 82-foot Nathaniel Bowditch was sold at an auction after a federal complaint was filed by Thomas Federle, when the former owners, Owen and Cathleen Dorr, defaulted on a $375,000 loan taken out in 2011. Federle was the sole bidder at the Feb. 14 auction held by the U.S. Marshal. He bid $250,000.